Does Trunature Digestive Probiotic Really Work? I most definitely know they do and so do others who use them. I’ve been taking Reuteri and Sustenex for several years. If I ever go off of them for more than a week, I definitely notice an increase in irritable bowel sysmptoms; bloating, gas, diarrhea, constipation, etc..
Digestive Advantage is what used to be called, Sustenex. This is interesting because Digestive Advantage has always had their own product before they took over the Sustenex, name. Neither Sustenex nor Trunature require refrigeration, where-as the Nature’s way Reuteri does. For this reason, I’ve always used both, assuming that refrigerated probiotics might have some benefits that the rest don’t have, despite the claim they don’t require refrigeration. I’ve noticed another thing – Reuteri is far more expensive at my vitamin store. The cost above is for the online price – how can they keep it refrigerated if you buy it online? I wouldn’t take a chance on it. Also, Sustenex was formerly sold at Costco for a low price very similar to Trunature Probiotics. Costco no longer carries it – it appears that the Trunature Digestive Probiotic has taken it’s place. 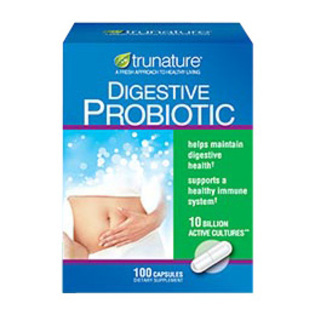 I will continue to use Trunature as my daily, non-refrigerated probiotic supplement. Year ago – back in my 20s and 30s, I was a fairly avid jogger. I used to jog between 2 and 3 miles a day, 5-days a week. Yet for some reason, I never got really good at jogging. I wondered why it is so much easier for some people than for me. These people with tall, lanky frames could seemingly run for ever without getting exhausted or feeling strained joints and body parts. I never got real good at jogging, but I assumed it was the only way to be cardiovascular-fit. By the time I reached, 40 years old, jogging became impossible due to hip pain, knee pain and back pain. I started finding other ways to exercise, including elliptical trainers, stationary and recumbent exercise bikes. In between, I take long walks. Even 20-30 minutes on a bike or elliptical begins to strain the body and with a busy work schedule, it’s hard to make time. Then, I heard about the Tabata Exercise Routine. Tabata is a high-intensity cardio and strength-training program that improves endurance, stamina and heart circulation in just 4 minutes a day. Izumi Tabata, a scientist from Japan, invented the Tabata Exercise Routine for high-performance athletes such as runners, speed skaters, track competitors, etc. Tzumi Tabata and other scientists actually tested his unique, exercise program on athletes and compared results with those who didn’t participate. They found that the athletes who practices Tabata had significantly better aerobic benefits from this form of exercise. Non-athletes, who have tried the Tabata exercise program have expressed measurable personal, health benefits from the routine, including improved energy, sleep, stamina, endurance and stronger immune system. I discovered Tabata while looking up gout prevention cures. Tabata was recommended as a way to improve the blood flow in the toes where gout most often occurs. I figured if it’s only 4 minutes a day, what do I have to lose. My only fear is that it requires running. Would four minutes of running be hard on my back or knees or is there another way? An exercise program couldn’t be more simple. Here is how you do the Tabata exercise routine in three simple steps. Step 1: Walk at a casual pace for 10 seconds, sprint like crazy for 20 seconds. Step 2: Repeat step-1 until 4 minutes have passed. At the end of 4 minutes, there is no doubt, your heart and lungs will be pumping like crazy. You’ll feel intense and immediate fatigue – that’s good, it means it’s working. My advice is to make your sprints a little slower at first and increase the intensity a little every couple of days or once a week until you’re at full speed. Of course, make sure you’ve had a physical check-up with your doctor before engaging in such a vigorous, aerobic program. What about the strain it puts on our hips and joints? Is there another way to do Tabata? My idea is that you don’t have to run to get the lungs and heart pumping. I use my stationary, recumbent bike to do Tabata. I cycle lightly with light-to-moderate resistance for 10 seconds, than pump the pedals as fast I can for the next 20 seconds, repeat and so-on and so-on until the 4:00 minutes are up. My bike has a pulse meter on it, so I know I’m really getting my heart beyond its maximum rate. Obviously, you can do Tabata on an elliptical trainer or any other type of Cardio machine. Whatever is convenient and works best for you. In between Tabata, I do pushups and moderate walks as well. I try to increase the resistance a little each day on the bike. After a couple of weeks of Tabata, how does it feel? Does it really work? Does the Tabata Exercise Routine Really Work? I can only speak for myself, but after 2 weeks of Tabata on the bike, 5 days a week, I’ve noticed measurable improvement in my energy, stamina and sleep – just as advertised. It’s important to note that the Tabata exercise routine made me feel very tired at first. It wasn’t an immediate improvement. After 5 or 6 times, however, I actually started feeling invigorated and great energy after the routine. Finally, my recovery pulse has dropped by about 12 beats-per-minute. Tabata really works. Have you ever wondered if you could get rid of a headache without taking pain killers? Or perhaps, you’ve taken one or more pain killers and still couldn’t get the headache to entirely go away. In my pain-relief article from a couple of years ago, I mentioned that Aleve was the most effective pain killer for permanently getting rid of a typical tension headache or the headache you get from too much alcohol consumption. There are a couple of problems with Aleve, however: One, it takes a while to work (as much as 2-3 hours). Two, Aleve is an NSAID (non-steroidal-anti-inflammatory), meaning it does present the risk of gastrointestinal side effects. I speak from first-hand knowledge when I say that Aleve, especially after prolonged use, wreaks havoc on the digestive system. One or two advil is another way to get rid of a headache – and it seems to go to work quicker than the aleve; both on the headache and the stomach ache. Advil is also an NSAID and while it goes to work quicker on the headache than aleve, it doesn’t seem to last as long. My headaches always seem to return about 4 hours after taking advil and along with a gut-ache. So, I guess the question is, how to get rid of a headache, naturally? Before we can answer that question, it would helpful to know what actually causes a headache. I think headache causes fall under three main categories: Allergies and Sinus Trouble, Dehydration and Tension.Obviously, other things like sleep problems and alcohol play a role too, but as I will explain, they all fall under these three categories. Allergies just aren’t caused by pollen, animal fur and other things we breath into our lungs. Allergies also can be caused by what we eat. I’ve often suspected that wheat and refined sugars can cause a headache along with allergies and sinus problems. There are many other things in our foods that can cause headaches such as nitrites and MSG. I can almost consistenly count on getting a very dull, all-over-the-head, headache the morning after eating more than 2 Bratwursts for dinner. Over indulgence in alcohol can obviously cause a headache too, but I think this falls under the category of allergies and dehydration. Usually, my headaches come-on in early in the morning and continually get worse until I take something to stop it. Since allergies and sinuses affect us most when we sleep, it is no surprise that the stuffy, itchy nose has a good chance of turning into a massive headache, especially, if we’ve been drinking on top of that (See below). Have you ever felt great relief from a sneeze? That’s a good sign that you’re having an allergy headache. Drinking too much alcohol can certainly cause the dreaded hangover headache. This is due to both, dehydration and the body’s allergic reaction to the toxins in the high amounts of alcohol ingested. There are plenty of other ways to get dehydrated other than just drinking too much alcohol. Have you ever traveled all day or had important business appointments and realized you weren’t drinking much if any water? You may have blamed your headache on tension from your busy day and unfamiliar surroundings when in reality, it could actually be dehydration. Unfortunately, by the time you realize you’ve not drank enough water, it is too late – the damage is already done. Dehydration is a very common cause of a headache. There are other times when we’ve drank plenty of water, abstained from alcohol and have completely no allergy problems when a headache forms in the back of our head. Tension headaches are the result of stress and easy to identify when we feel them coming on and realize the mood we were in when it occurred. A tension headache doesn’t have to be confined to just the back of the head, but it often is in a completely different place than the typical allergy headaches. Lack of sleep or change in sleep patterns can also cause tension headaches. Once we’ve identified what causes a headache, we become far more aware of the triggers and signs for preventing them. Obviously, the best way to get rid of a headache is to prevent it from happening in the first place. That is sometimes easier said that done. Still, it may be easier to avoid a headache than to get rid of one once it’s with us. Despite staying hydrated, avoiding alcohol and allergy-causing foods and triggers, sometimes headaches still occur. Taking anti-inflammatory drugs like Naproxen and Ibuprofen everyday are not only hard on the stomach, but we can actually become too dependent on them, which in-turn can actually increase the frequency of headaches. Rebound headaches occur when our body forgets how to naturally avoid them and let them heal on their own. A better, long-term, natural headache remedy is to train your body to cope with it on its own. In my own personal experience, I’ve that almost all headaches will go away on their own within 24-hours whether medication is used or not. But, who wants to go 24 hours putting up with the constant, nagging pain? It will wear you out. Thankfully, there are a few things we can do to relieve the pain and get us through the ordeal. I’ve found that the Sinus Rinse and Alkalol remedy for sinus pressure works almost instantly in relieving headaches associated with allergy problems. Do the rinse immediately at the first onset of headache pain and continue using it every 2 hours. Applying a cold ice pack to the area where the head hurts provides almost instant relief. Gently apply the ice for about 7 minutes at a time as needed. Doing this has gotten rid of some of my headaches completely. To some, especially during the cold winter months, ice might seem counter-intuitive as opposed to heat. Because headaches are caused by inflamed blood vessels, heat might actually make it worse even though it might sound good. Try the ice, but don’t over do it. Cayenne pepper has proven to be a very effective natural medication for a variety of aches and pains. I’ve even endorsed Capsaicin Cream for arthritis pain: Capzasin HP. I doubt it would be helpful to rub the Capsaicin cream on your forehead. A more effective way to get the benefits of peppers is by either eating them or inhaling an over-the-counter, homeopathic nasal spray. Sinus Buster provides instant relief and is even more effective after doing the sinus rinse described above. Applying direct heat to a headache might not be good, but a hot, steamy shower is often very helpful for relieving allergy/sinus related headaches. Twenty to thirty minutes of aerobic exercise will often make my headaches completely go away. I realize that Jogging, cycling, etc., is the last thing you feel like you want to do when your head is throbbing, but it really helps. Start-out slow and it gets easier as you go. A good, strong cup of coffee nearly always relieves my headaches almost right away. Caffeine is a proven pain remedy. The pain usually comes back after the coffee wears off, but at least it’s a tasty way to get started in the morning and improve the outlook of your day. Relaxing, deep breaths can often provide immediate relief from headache pain. Don’t gasp for air when you breath – just take deep, natural breaths; hold for a few seconds and exhale slowly and fully. Is there any one, single, sure-fire, cure-all, but natural, cure for the common headache? Probably not. Will the things above help you feel better while you practice the will-power of refraining from resorting to the medicine cabinet? Absolutely. These seven, natural headache remedies will make your headaches more tolerable until it eventually subsides on its own. By resisting the urge to take over-the-counter, pain pills, you will eventually learn how to cope with headaches in a much more natural, healthier way – and hopefully experience far less of them. [yasr_visitor_votes size=”medium”]I finally decided to give Arnicare Arnica Gel a try after throwing my back out last Saturday. Arnicare arnica gel is a natural, homeopathic pain relief remedy which supposedly provides instant relief from pain and stiffness of sore muscles, bones and joints. I have known about Arnica for a couple of years but was hesitant to try it as I am with all natural, homeopathic remedies. Does Arnica gel and these other natural creams really work or are we just throwing are money away and thinking they work long after the pain would have naturally subsided on its own, anyway? Furthermore, what is actually in this Arnicare gel product that is scientifically proven to reduce or relieve pain? Something doesn’t gel. I decided to look up this peculiar arnica gel and find out. Arnica is made up of numerous herbs from the sunflower family. Crazy, isn’t it? Sunflower herbs are supposed to cure an aching, sore, painful back and other muscles and also relieve stiffness? Arnica, is a greek-derived name referring to the soft, hairy leaves of the herb. (Arnica doesn’t sound much like a gel does it?) As you can see from the picture of the arnica derived plant, it actually looks somewhat like a long-leafed sunflower. Why anyone would think that the oils or gel from these Arnica herbs could actually be used as a pain remedy? I haven’t the slightest idea. I suppose the best answer is that studies of other cultures have proven that arnica has been used for centuries among many civilizations as a pain remedy. Turning it into a gel obviously makes it easier to rub arnica into the skin. Despite its history, however, there is absolutely no scientific studies or research that have proven arnica, much less arnicare arnica gel is an effective pain-relief remedy. This explains my hesitance to use or try these gel or cream products. The arnica gel, itself is clear with a very slight, yellow tint. Arnica looks like a clear-yellow , think gel. Though the makers of Arnicare arnica gel say it has no odor, it does have a little bit of a scent which sort of reminds me a little of a sweet, dandelion or weed with a bit of alcohol aroma. Arnica does not have an unpleasant odor and seems to dissipate after you’ve applied the gel. So, that explains what arnica gel is, the next question is, does arnica gel really work? I can only speak for myself, but personal experience is the best research for natural pain medications, isn’t it? When I throw my back-out, the pain and stiffness is severe and the first three days it is nearly impossible to straighten my back when I walk. I wouldn’t even dream of expecting a natural, pain gel to help such a severe pain. At the onset of pain I usually begin the anti-inflammatory treatment which consists of either Aleve or Advil. As much as I like Aleve for headaches and other problems, it did very little for my back. This was confirmed when I called my doctor, asking for a muscle relaxant the next day. The nurse told me that Ibuprofin or Advil is much better for back pain and now I believe her. 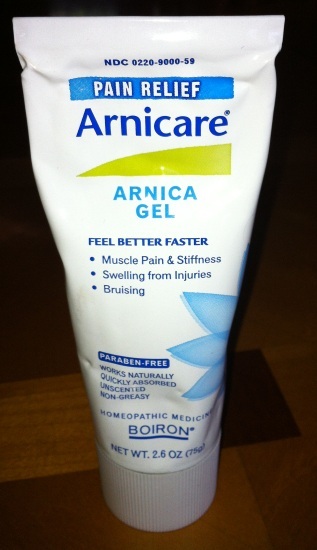 I bought the Arnicare arnica gel on the 3rd day of my malady as I was already loosening up and getting better. I applied some arnica gel to my lower back and experienced absolutely no difference in the symptoms. While my back was getting better on its own, I went back to the Capsaicin Cream which is also a natural remedy derived from hot peppers, but is a cream and not a gel. Unlike the arnica gel, Capsaicin cream actually provides a warming, heat sensation and really does provide some relief from the stiffness and pain – most noticeably, the stiffness. Does arnica gel work? My answer is, no. My recommendation for pain-relief cream is Capzasin HP Capsaicin Cream. The best way I can describe this upper leg socket pain is that it feels like my leg is literally being pulled out of the socket, near the inside of the hip and groin. At it’s worst, it becomes nearly impossible to lift my leg and certain positions make the pain excruciating. It is difficult to walk and even sleep at times. I felt the first symptoms of this about 40 years ago when I was only a 4th grader. I could barely walk, let alone play football and enjoy my other favorite activities outside with my friends. Overtime the pain and stiffness in the joint loosened up, but it took several weeks for the pain to completely subside. Since that time, the pain and symptoms have returned several times. After 40 years, I’ve learned to live and cope with this mysterious ailment, but until recently I never took much of an interest in actually identifying the problem and curing it. 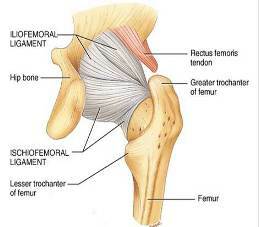 The pain and stiffness always occurs in my right, upper leg. Some quick internet research proves that this is true of most of us who suffer the problem and perhaps lends a clue to its cause as I’ll explain later. First, let me make it clear that my discovery of the cause and solution had very little to do with scientific, systematic research. In fact, I know very little about human anatomy. One of the things that makes this ailment and pain so difficult and troublesome is that it is really hard to identify and point out the exact location. The best way I can describe it is that the pain is deep inside where ice or heat cannot even touch the affected area. If I was going to use a pain medication cream, I wouldn’t even know where to put it. It wasn’t until I explored my physical habits, posture and tendencies that I stumbled upon the answer to this problem. I am convinced that my own, upper leg joint and hip socket pain is emotionally caused. Call it nervous tics; anxiety; stress or whatever else you want, but my own physical habits and posture are to blame. One day as I was sitting at my desk at work, something very revealing dawned on me: I was constantly torquing my leg; twisting it, crossing it, folding it under my lap; bending it. As I analyzed that, the whole thing hit my like a ton of bricks. Of course, my leg socket and hip joint were hurting! It is of no surprise that it feels like my leg is being pulled from it’s socket. While I’m sitting at my desk, I’m constantly twisting my right leg and putting stress on it. Over time, the constant pressure and stress of unnaturally bending my right leg is bound to make the joint in my hip hurt. I’m damaging my own body, what else would I expect but to feel the effects from that? Yet, why would I do such a thing and why only the right leg? Years ago in grade school, I remember how I used to bend my upper right jaw while I was sitting at my desk in school. I had no reason for it, but I kept doing it until it hurt. This is a classic example of obsessive compulsive behavior, yet I wasn’t aware of it. Days later, my jaw and gums would be so incredibly sore, I could barely stand to eat or drink a glass of water. The pain was excruciating, yet for some odd reason I was not even aware of what caused my own hip socket pain. It would take me several days to discipline myself to stop repeating the same obsessive, compulsive habit that was causing injury to my jaw. Does this sound familiar to you at all? This is the exact same thing that is going on with my right leg. When I analyzed my posture while sitting at work at my desk or even at home watching TV, I noticed I was doing some very unnatural bending and twisting of my leg. Once I noticed the behavioral pattern, trying to get myself to stop caused me great anxiety. It was a very restless feeling, yet I knew that I would have to discipline myself to give it a chance to work. I made a mental list of the do’s and don’ts for curing my own, upper-leg, socket hip-joint pain. Avoid Crossing the Legs: It became obvious to me, that leg crossing puts unnatural stress on the hip joint and socket where the upper thigh part of the leg meets. Don’t lock the knees: Locking my knees in place while standing or sitting puts pressure on the same hip joint. Don’t do it! Don’t sit on either one of your legs. Doing so is a great way to pull that hip joint away from the hip socket. Who wants to do that? Don’t twist or bend the legs. That’s putting stress on the ball joint thus causing hip socket pain over time. Sit Straight with an upright posture. Resist the temptation and compulsion to twist, turn and contort your legs and hips. Relax and stand up whenever you feel the urge to contort. When Driving keep toes pointed towards the road. Probably another reason that hip pain is usually in the right hip is because that is we use the gas and brake pedals with our right feet. Ultimately, the cure for the painful leg socket pain is to resist the urge and nervous compulsion to twist, contort and bend the legs and lock the knees. When I first recognized the bad habit of my posture, it took some very strict discipline to get myself to stop. Like any type of OCD behavior, forcing one’s self to practice good posture takes tremendous discipline and will-power. At first, I felt the overwhelming urge to twist my leg and twist it hard – until it hurt. It caused me great anxiety to resit the temptation to fall back into my old habits. My desire and certainty that there was a light at the end of the tunnel is what gave me the perseverance to stop the destructive habit. I also believe that because I’m right-handed and most people are right-handed is a clue to all of this. Most of us are right handed and we put the most emphasis and weight on our right arms and legs. If you research this hip-socket ailment on Google, most of the inquiries are for the right, upper leg. Another common link to the upper, right leg pain seems to be lower back problems. I am unsure whether or not the lower back causes the nervous twitch that throws my hip and leg out of alignment. It is quite possible that the nervous tics and bad habits with my posture are the reason for the lower back problems in the first place. One word of encourage: It is most difficult to give up the bad, physical tics in the first two days. The upside is that I immediately began to feel relief from the pain after day two, which encouraged me to continue disciplining myself and avoid the bad tendencies which were putting stress on my leg socket and hip joint. The light at the end of the tunnel is to freedom from the pain and much better, more fluid and easier motion of the leg. Ultimately, perhaps the leg and hip joint once completely healed will lead to better overall posture which in turn will result in freedom from the lower back pain and stiffness. Good posture means everything. As of this writing, my leg-hip-socket-joint pain is nearly unnoticeable. This is after only two days. I look forward to continuing the effort in getting rid of these destructive habits which wreak havoc on the mind and body. If by any chance, you’re also one who suffers from leg joint and hip socket pain, please let me know how this works for you.